Haegue Yang’s second exhibition at dependance after her first show UNFOLDING in 2004 consists of a new series of mirror works, which is the first presentation of entire series. 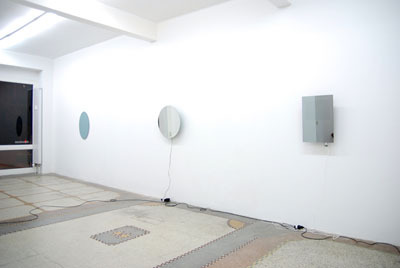 Her show “Foxed in the Forest” constitutes a minimal, yet concentrated presentation with six mirrors on the wall. Each mirror shows a certain kind of interference that it negates or neglects to reflect the viewer’s image on it. BACK is an elegantly shaped oval mirror, which simply turns its back to the viewer. In other words, it prefers to reflect ‘the wall’ a la Bartleby! (EYES OFF), the other rotates itself as subtle/silent yet persistent to its predefined nature to reflect (NON-MOVING SELF). This series also includes three rectangular mirrors with sensor technique. 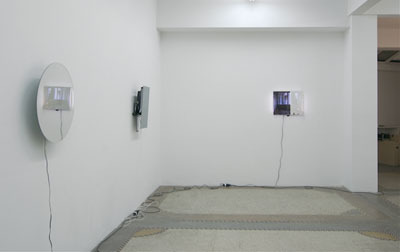 Each of them changes its character depending on whether the viewer approaches the mirror or not. One changes from a simple reflecting surface to a TV (WATCHING YOU) when the viewer comes closer. The other turns into an image (ULTERIOR THOUGHT) or text/time board (FOXED IN THE FOREST). What each mirror’s performance suggests is what the artist observes in her own daily life, i.e. the frequent co-existence of radio or TV at work in order to keep herself alone without feeling alone. In her mirror series, she reveals her struggle with herself between being effectively concentrated and helplessly distracted by inspiring yet somewhat destructive thoughts while both are seamlessly overlapped in the mirror. Haegue Yang’s current artistic interest lies in the on-going act of questioning the construction of ‘self’ and ‘subjectivity’, which is often driven by her own daily experiences with herself. The mirror series builds her own visual and allegorical interpretation of her thoughts on an engagement with the self as well as with the other. Yang invites the others to the negative space of herself to provide a space in the mirror, where the self and the other could meet and miss constantly. Haegue Yang (born 1971 in Seoul) lives and works in Berlin and Seoul. 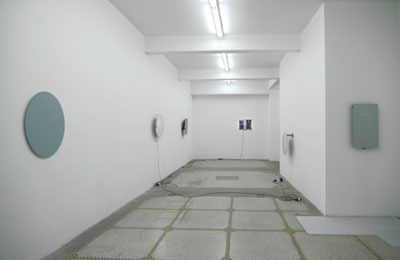 She took part in Manifesta 4 (2004), Sao Paolo Biennale (2007) and Made in Germany (2007). This October she will be part of the group show, ‘Feminist Legacies and Potentials in Contemporary Practice’ at MuHKA, Antwerp.